For quite some time now, even for years before the current administration invaded the White House, we have seen a Congress so divided that it almost makes a mockery of the words “democratic process”. We have seen a Congress that pays little, if any, heed to the will of the people, the betterment of the nation, but rather are acting in their own best interests. It speaks volumes when even former members of Congress are speaking out against the uber-partisanship and asking Congress to step up to the plate and do what they were elected to do. A group of 44 former senators has penned a letter to the current and future senators, asking them to set aside their partisanship and self-interest for the sake of guarding our democratic principles. Will they listen? The struggle for goodness and decency is an eternal struggle, not a seasonal one. Do we have a right to weariness in an era of animus? More precisely, can we afford it, or is exhaustion a luxury reserved for those whose wealth, privilege and status insulate them from the losses the rest of us could suffer? Does patriotic defense of country require perpetual, obsessive vigilance, or is it permissible to retreat occasionally for one’s own mental and spiritual health? These are questions I ask myself regularly, and ones that are frequently asked of me, if not in those exact words. People are trying to figure out the proper posture to take in a world riven by deceit and corruption, a world in which the leadership of the country represents an assault on decency. This is a conundrum, I must confess. I, as much as anyone else, feel trapped by our current predicament. I would love nothing more than to write about other things, worthy things, more intellectually stimulating things. But for more than two years, I have written almost exclusively about Donald Trump. I feel compelled by what I view as history, fundamental and consequential, playing out right before me with nothing short of the life of the republic at stake. And yet, at a certain point, words begin to fail, or the obvious has already been stated. Once you have pointed out that Trump is a liar, you can then note only that he is telling more lies. The same goes for his racism, bullying, anti-intellectualism, corruption and grift. At some point, it becomes clear that the abnormal, outrageous and unacceptable have become a constant, and even the rolling boil of righteous folk’s indignation reduces to a simmer. I hate to bear that message, but it is the only one I can deliver if I wish to be honest rather than popular. As much as there was to celebrate last week, with liberals winning control of the House of Representatives, and doing so with such a diverse slate of candidates, it was also clear that Republican control of the Senate means that any hope of removing Trump via impeachment has shrunk to nearly nothing. Even if the House impeaches Trump, the Senate remains highly unlikely to remove him. Democrats are even debating how far they can take oversight in the House without turning off people politically. The only hope is that the Robert Mueller investigation may deliver something so damning that some Senate Republicans view it as unacceptable. But there is no evidence as of yet that anything would sway them. Trump is taking steps to severely hamper Mueller’s efforts. Last week, he fired Attorney General Jeff Sessions and installed Matthew Whitaker as acting attorney general. The F.B.I. is currently investigating corruption at a company where Mr. Whitaker sat on the advisory board. It is very likely that we are stuck with Trump until the 2020 election, and even then the Democrats can take nothing for granted if they wish to defeat him. That is the root of people’s distress. How can Republicans in Congress abide this behavior and use it for political positioning? How can so many of our neighbors condone open hostility to minorities, the press and the truth? Or maybe the questions are for us. How could we not have registered fully just how hostile a substantial portion of America is to inclusion and equality? How could we not have registered the full depths of American racism and misogyny? How could we not remember that American progress has always been like a dance with a disagreeable partner, stumbling backward as well as moving forward? I remember calling my mother when Trump was elected, and she was not nearly as distraught as I thought she’d be. Her stated reason: We’ve been through worse. She is an elderly black woman from the South. Her sense of history and heartbreak are long and fraught. Recently, I’ve delved even more deeply into this line of thinking, reading about how black people positioned themselves during both Reconstruction and Jim Crow, when the political structures were largely arrayed against them. I wanted to know how they survived and made progress against open hostility. The recurring themes are to never lose hope in the ultimate victory of righteousness; to focus your fire on the things you are most able to change; and to realize that change is neither quick nor permanent. Don’t beat yourself up if you need to tune out every now and then and take a mental health break. There is no shame in it. This is a forever fight. Once you have recharged, reapply your armor and rejoin the fight with even more vigor. This is the news we have all been waiting to hear. I hope this is the beginning of the end of the Trumpian Reign of Absurdity. Many thanks, Gronda, for being on top of this and keeping us informed! I’ve been waiting to post on the news of the republican President Donald Trump’s former campaign manager Paul Manafort until more information was available as to whether he was cutting a plea deal with cooperation or with non-co-operation with the FBI. It is pretty much a consensus that Mr. Manafort is most likely counting on a presidential pardon sometime in the future which is a reasonable expectation as President Trump has hinted that he would be willing to do so. It is my hope the the FBI’s Special Counsel Robert Mueller III, head of its Trump-Russia probe would not cut a plea deal without this reality being a consideration. I suspect that Mr. Mueller would not consider a plea deal without co-operation unless he has determined that he doesn’t need Mr. Manafort’s assistance to build a strong case and without accounting for a possible future pardon. David Shulkin – Former United States Secretary of Veterans Affairs – spent more than $122,000 of department money on a 10-day trip to the UK and Denmark in July 2017—which involved only three and a half days of meetings. A government investigation into the trip found he had committed several “serious derelictions,” including bringing his wife on the trip at the taxpayer’s expense and improperly accepting free Wimbledon tickets. Steve Mnuchin – Secretary of the Treasury – requested a government plane to take his wife on a honeymoon to Europe, and has come under fire for spending nearly $1 million on just seven trips. Scott Pruitt – Former EPA Administrator – spent $168,000 on charter, military, and first class flights in his first year in office, despite EPA guidelines saying he should travel coach. The trips often included weekend layovers in his home state of Oklahoma. Pruitt splashed around $43,000 on a sound-proof phone booth in his office (to name only a few!). Ryan Zinke – Secretary of the Interior – failing to keep proper records of his travel, been criticized for booking charter flights, and taken helicopters costing thousands of dollars when he could have taken a car. He spent $139,000 on new office doors (following a slew of embarrassing headlines, he says he has cut their cost by nearly half). Ben Carson – Secretary of HUD – ordered a $31,000 dining set. The inspector general of Carson’s agency is also investigating whether Carson broke ethics rules by involving his son, the owner of a private equity firm, in government activities. Tom Price – Former Secretary of Health & Human Services (HHS) – spent more than $1 million of taxpayer funds on his own travel in private jets. Wilbur Ross – Secretary of Commerce – pledged to recuse himself from any matters involving his shipping interests, but he negotiates trade deals that could benefit some of his shipping interests. Betsy DeVos – Secretary of Education – despite a potential conflict of interest, increased by as much as $10.5 million her investment in Neurocore, a company that offers brain performance training to children with attention deficit and hyperactivity disorder, anxiety, autism and depression. And the list goes on … and on … where it ends, nobody knows! Donald J. Trump – continues to earn money from his businesses. The Trump Hotel in Washington, D.C., has become a fundraising mecca for special interest groups, foreign governments, Republicans and GOP-aligned groups. Trump’s Mar-a-Lago resort doubled its initiation fee after Trump’s election. Trump has also visited his properties more than 100 times since he was elected, according to news organizations that have tracked his travels. Do I recall somebody promising to “Drain the Swamp”??? That’s right, folks … the death toll, reported by George Washington University, was cooked up by some unnamed, evil democrats who only want to make Trump look bad. Does anybody else feel like just slapping this man across the face … over and over again? The Washington Post’s Fact Checker was quick to issue Trump’s claim a ‘Four Pinocchio’ rating. According to The Washington Post’s Josh Dawsey, the cheapest entry price is $35,000 per couple, which entitles an attendee to dinner. A “photo opportunity” with Trump costs $70,000, while participating in a roundtable with the president requires $100,000. Now I ask you … who in their right mind would pay $70,000 to have their picture taken with … a slimeball??? And by the way … the purpose of the fundraiser is his 2020 campaign. Shoot me now. The fun just never stops, does it? Have a great evening, folks! 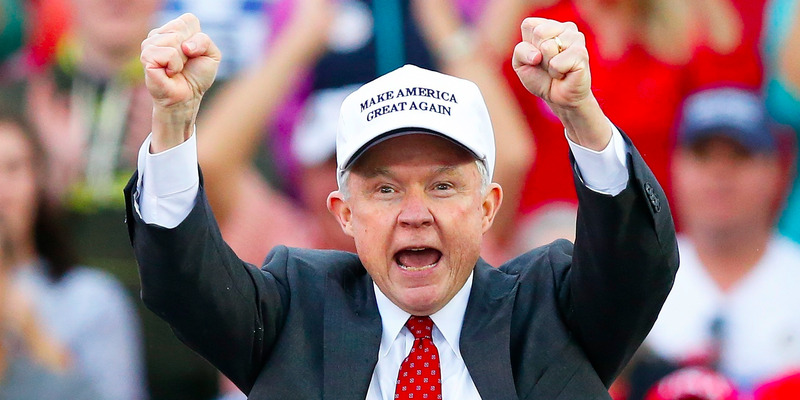 You will never, ever, in a million years believe this, but Jeff Sessions lied under oath! Yes, I know it’s incredible, but our friend Gronda has all the details. Seriously, though, this is important information and Gronda has done an excellent job of summing it up for us, so please take a few minutes to read … the rest of the story! Thank you so much, Gronda! The republican President Donald Trump’s Attorney General Jeff Sessions who was the former senator from Alabama, finds himself in hot water again. When he has testified in the past before his fellow senators, he has managed to evade uncomfortable questions with carefully worded statements and answers. With recent revelations, his fellow senators want him to explain under oath certain omissions in his past testimony. It seems that the recently FBI indicted George Papadopoulos has disclosed facts about a meeting where Mr. Sessions and the president were present. The campaign foreign policy adviser was discussing how he had Russian contacts who would share their data on the democratic candidate, Hillary Clinton.